Imaan turns 5 today. It was also a days of few firsts. According to his school report, he was able to put correct number of pebbles on 1, 2 and 3 for the first time. At home he has been counting items for a while but has never shown this ability at school and this may indicate he is slowly overcoming his sensory problems when he is outside the house. When his grandparents called up from Malaysia, he was singing "Happy Birthday" along with them on the phone as well. We had a small party at home. 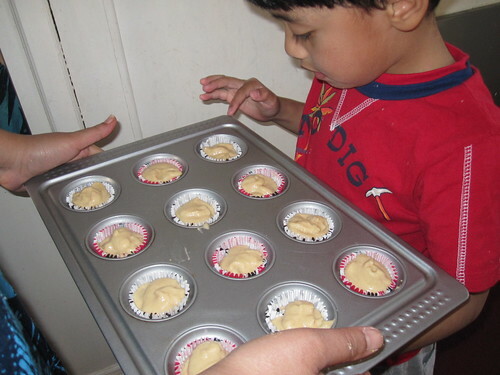 We baked him some gluten and casein free SCD almond cupcakes as well as one big one. 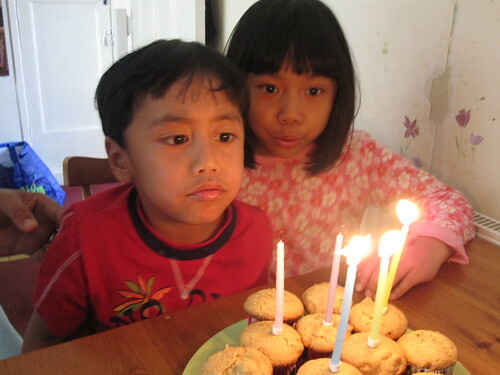 He was really excited and he couldn't wait for the big cake and so we went ahead and put candles on the cup cakes. And for the first time in his life, blew out the candles. Right after that he wanted to have another go. In the end we ended up singing Happy Birthday several times over.